Before I get to the real meat of this post, I want to go on a little tangent. Today I visited two of my favorite people, one of whom helps me out immensely with this techy blog stuff. I’m getting better at it but there is no way I would be able to do or understand some of this stuff without his help. So thank you mucho, Sarmad! Amidst munching on our deliciously flavorful, spicy, authentic pork burritos, we explored the cavernous pages of WordPress. This is another side note but there really is a big difference between managing your own blog through WordPress.org and utilizing the free version with WordPress.com. If you’re a newbie like I am, use WordPress.com and play with it. Otherwise, you’ll have much more artistic freedom using dot org. But nevertheless, Sarmad aided me in my quest to stream an MP3 file so I could get the full effect of my post, which discusses stuffed animals, in particular the Velveteen Rabbit. Ready for inner child stuff? Here we go. If you have never read or heard of the story The Velveteen Rabbit, I highly recommend you click on that link to take yourself to Wikipedia, which will outline the entire story for you. The Velveteen Rabbit is only one speck from my world as a kid. I was into Barbies, My Little Pony, Carebears, Rainbow Brite, the Beatrix Potter characters, Cabbage Patch Kids, Transformers, Voltron, Big Wheels, Legos, Nintendo games, absolutely everything. I was a voracious reader and devoured books – especially ones that had any kind of deeper message, at least to kids. This story is about children’s imaginations and loving something so much that you really believe it loves you back, despite it being inanimate and not really alive. Whatever the reason, this one story helped me commence my deep love for stuffed animals – particularly bunny rabbits. My bestest friend Helen can attest to the fact that I have a love for bunnies. I even owned one when I was 19. He was a soft, white and grey little thing with lovely chocolate brown eyes. I named him Oscar. Unfortunately, I knew nothing about training a bunny rabbit that I had found at a pet store. He chewed on everything, pooped everywhere he hopped and wasn’t always keen to being held. But boy did I love him. If I find a photo of him in my vast photo collection, I’ll put it up at a later date. Sadly, I felt it was my duty as a loving owner to give him up when I realized that I was unable to care for him the way he should be cared for. I didn’t want to see him cooped up in a cage in my apartment but neither did I know how to handle getting him trained so he wouldn’t chew on/poop on everything in sight. I took him to the Humane Society and I prayed that he was picked up by a loving family. He was so handsome and sweet. My mom was not taken in by his cuteness when she realized he had chewed through the cord of her $200 lamp, however. She had to get it rewired and I never heard the end of it. In any case, a couple of things added to my already capricious imagination. One was my paternal grandmother reading me the Beatrix Potter series of children’s books, beginning with The Tale of Peter Rabbit. Isn’t he darling? One of Peter’s sister’s names is Flopsy, and one year for Easter, my brother and I were given these soft, white stuffed bunny rabbits. Without a second’s hesitation, I named mine Flopsy. She was my play companion and the “head bunny” in my collection for several years. I must have been anywhere from 8 to 10 years old at that time. My collection of stuffed animals and bunnies grew over time but she always remained the one I relied on to keep any nighttime goblins away, not to mention someone to talk to if I needed it. Around the same time, if not a couple of years prior, my brother and I were treated to a listening of the story of The Velveteen Rabbit on cassette. It was narrated by Meryl Streep and the piano music was all done by George Winston – a brilliant pianist. I have many of his albums in my current music collection. My brother Zack and I fell in love with listening to it and were given our own copy. To be quite honest, I cannot tell you how many times I’ve actually listened to the story, since over the course of twenty years, I have probably heard it at least a thousand times. One of the most poignant and tender moments of the story (indeed, the climax) is when the little velveteen rabbit hears the Boy tell his nanny that he is not a toy to him – that he’s Real. It’s a really uplifting moment that tugs at the heartstrings, especially if you’re having a particularly, uh, hormonal day/week. It has definitely brought tears to my eyes as an adult (yes, I admit it!) but as a child, I would always clutch one or more of my stuffed animals that I slept with (and folks, I slept with a pack), and think about how I knew that I loved my stuffed animals enough that they were also Real. So it is my pleasure to be able to give the gift of listening in on the clip from the story. There is not one singular element that makes it so achingly sweet to me – it is an absolute combination of the narration accompanied by George Winston’s brilliant piano music. I don’t expect everyone to get it. I even had my doubts about sharing this aspect of myself, but since it’s on my mind and it’s the most predominant thing I want to write about, here it is. Some people bury their inner children under many layers of stress and cynicism. Mine is alive and well and reminds me she’s in there when I have these kinds of things on my mind more than a fleeting moment. Somewhere, in one of many boxes of photos, I even have old photos from almost twenty years ago that I took of my old stuffed animals. I played with them outside, took them around with me – they were my pals. And it wasn’t because I didn’t have real live friends. But my imagination was just so strong that they were my outlet. One year, my mother got my brother and I our very own stuffed “velveteen rabbits.” You should have seen the look on my face at Christmas when I got mine – because like in the story, he came in his own little stocking. (AHHHHH! IT’S TOO CUTE!) I have no idea where that little guy went, but I loved him fiercely. As a way of differentiating the stuffed animals I played with, I even put dabs of my mother’s different perfumes on their noses. I believe my little velveteen rabbit (named Satin, for his pink ears) had Obsession on his nose. haha! I can’t believe I remember that. I forget what Flopsy had. I think I mixed perfumes and so she just kind of smelled weird. I remember my mom putting her in the washing machine because of it. Flopsy came out a little pilled and matted. She was never the same. The smell didn’t really go away, either. There is one last, rare book of which I’m in awe of its existence. I don’t know how old this author was when he put it together but it is pretty brilliant, at least coming from someone like me who had (and still has) an overactive imagination and a love for animals, stuffed or otherwise. 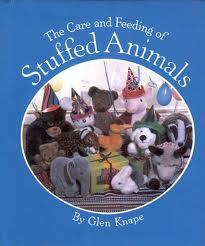 The book is entitled The Care and Feeding of Stuffed Animals. I even found it on Amazon! While most people would find this extremely bizarre, it’s great for kids who want to take it seriously (it’s a complete glossy, color photograph book with pictures of all sorts of situations that “stuffies” can get themselves into) and hilarious for adults who want to see the satire in it. I forget where I got my own copy from, but the only reason I found out about it was when I was in my dentist’s office as a kid and they had a copy in their waiting room. I read it with fascination. I couldn’t believe there was some adult out there who felt like I did and actually wrote a book about how these creatures should be treated, trained, fed, watched over, etc. I tracked it down years later and have a copy as an adult. I haven’t read it in years and years but it’s fun to have around. On page 33, there is a caption of a photo of a stuffie who has gotten himself into the blender and another one looks on in amusement and horror. It’s pretty comical. Since there are used copies selling for as little as $.30 on Amazon, I’m sure you could get one for yourself if you were so inclined. I’d love it if someone left a comment if s/he has heard of it, much less read it or owned it. So that is it, friends. As of late I have been thinking back to my childhood a lot and my experience with my bunnies and stuffed animal collection. It all just came rushing back to me as I sat here writing this. I think my childhood is also in the forefront of my thoughts since I have the audio CD of The Velveteen Rabbit in iTunes and sometimes the clips come up randomly while I’m listening to music. The album I have has both the narrated and un-narrated clips but since I’ve heard the story so many times (and trust me, my parents were exhausted of the thing after a time!) I know exactly which part of the story it reflects, even without narration. I totally understand why it earned a Grammy nod or won the Grammy itself. Meryl Streep, you go girl, in all your fake British accent glory. Thanks for sharing in a deeper part of my inner workings. More up-to-date and adult-related posts to come! I don’t have any stuffed animals around in my room currently but if I did, I’d probably go run and hug one. Zoe, what a sweet window you gave us to your childhood! I actually never read The Velveteen Rabbit as a child, but I did read it to my children and loved the story so much that I bought the book for our own home library (had checked out from library). 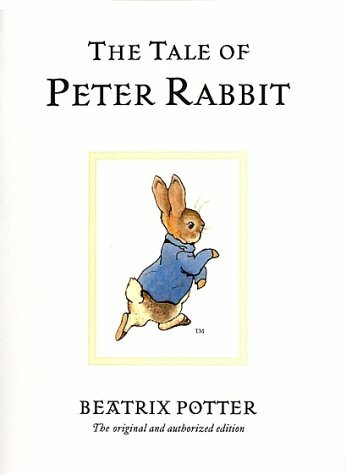 Another favorite of our is Beatrix Potter and I own the books separately (little bitty books) and also a large, complete volume. It’s nice to know that you enjoyed this books and i hope my children have the same fond memories you do. p.s. I’m pretty savvy with WP.org, so if you have questions let me know. Amanda, I’m so touched! Thank you for your thoughtful comment (and for coming to check out the site). It’s been so long since I’ve written this post and it helped me to go back and see how far I’ve come, at least blogging wise. I may take you up on your offer to answer some questions about WP.org sometime!